The NY Times is reporting on Wal-Marts new, cheaper health plan for its workers. The question is, are they making this move because of outside pressure and focus on their poor working conditions? 15 million sounds like alot of money. However, the donation needs to be put in perspective. Last year Wal-Mart earned 288 Billion dollars in sales and 10.3 Billion in pure profit. For 2004, the average per capita income in the United States was 32,937. Wal-Mart's donation equals .005% of its revenue. If the average American citizen were to gauge their donation by the benchmark set by Wal-Mart they would donate only $1.65 to the relief effort. Is Wal-Mart good or evil? Sam Walton would be stunned to learn the company he founded in 1962, now ranks with the war in Iraq, prayer in the schools and gay marriage as one of the polarizing public issues of our times. For Mr. Walton, the formula for corporate virtue was simple: provide the widest array of goods at the lowest possible price. His company has done that with relentless success for decades, transforming the global economy and, in the process, becoming the world's largest retailer. To run the new effort, the UFCW hired a refugee from Howard Dean's political campaign, Paul Blank, who operates out of cramped offices on Washington's K Street, where the walls are covered with maps and hand-drawn anti-Wal-Mart signs. Meantime, the Service Employees International Union, another break-off union, has established a rival site, Wal-Martwatch, with support from liberal groups including the Sierra Club and Common Cause. "We have no intention of trying to organize Wal-Mart workers," says SEIU President Andrew Stern. "The purpose is to change Wal-Mart's business model -- a business model that rewards shareholders and executives and doesn't reward workers." To date, there is no sign this strategy is hurting Wal-Mart's sales. Wake-Up Wal-Mart boasts 68,000 registered members -- roughly the same number of people who walk into a Wal-Mart every five minutes. Still, the company is clearly taking the threat seriously. In today's NY Times there is an op-ed by a Harvard Business Professor and a business consultant praising the virtues of Wal-Marts so called low prices. It is always interesting when people learned in economics throw out some of the fields basic tenets when lobbying on behalf of their own class material interests. Wal-Mart's low prices are not a gift. There is no free lunch and the savings from Wal-Mart's so called low prices must come from somewhere else. Fair enough the authors of the op-ed argue that when taken in its totality the benefits of Wal-Marts low prices outweigh whatever costs are incurred by other groups. Yet the authors fail to show us where we can view their full research on this subject. They offer a figure of 16 billion dollars a year in savings for the US consumer and we are to take their word that this figure is accurate and that it far exceeds so-called costs associated with the destruction of jobs at competitors, low wages, government subsidies, and the increasing use of welfare systems to support Wal-Mart workers. Lastly, these men of business try to take the moral high ground by arguing that in reality one of the main benefactors of Wal-Mart are the urban poor. I'm always weary when the defenders of big business make claims that their activity is actually pro-working class. Especially when we can see the results of big business policies in our communities on a daily basis. 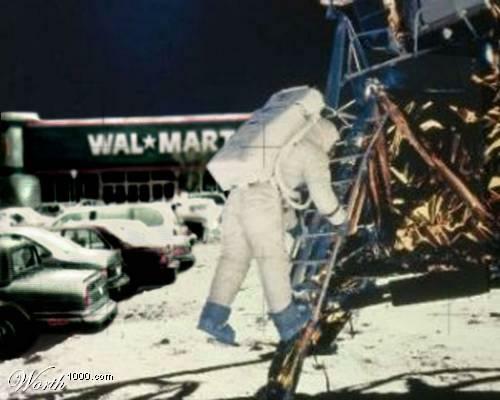 When Wal-Mart Stores Inc. became the world's biggest public company, it also became one of the world's biggest targets. The barrage of criticism reached a crescendo last year as Democratic presidential candidates lambasted the company's employment practices. Over its 43-year history, Wal-Mart typically ignored its critics. But after the primaries were over, Chief Executive Lee Scott went on the offensive. Through Thomas "Mack" McLarty, a former Clinton aide and a consultant to the Bentonville, Ark., retailer, Mr. Scott arranged a September dinner in Washington, D.C., at Mr. McLarty's home with several former Clinton administration officials. But a couple of years ago, under fire for everything from its health-care benefits to the size of its stores, Wal-Mart decided to wade into the controversy it creates and gave Mr. Scott, 56 years old, responsibility for leading the offensive. So for the past nine months, he has crisscrossed the country as Wal-Mart's defender-in-chief, grappling with activists of every persuasion, including congressmen, environmentalists and Sister Barbara Aires, a Catholic nun and longtime critic. In many ways, his personal evolution mirrors that of the company. "Over the years, we have thought that we could sit in Bentonville, take care of customers, take care of associates and the world would leave us alone," Mr. Scott said at a Goldman Sachs investors' conference earlier this year. "It just doesn't work that way anymore." A former Wal-Mart executive responsible for inspecting apparel factories in Central America has sued the company, accusing it of firing him for being too aggressive about finding workplace violations, like locked exits and mandatory 24-hour shifts. The executive, James W. Lynn, said he upset Wal-Mart officials by complaining vigorously about apparel contractors that fired pregnant workers and about one company official who, according to several inspectors, was corrupt and treated substandard factories leniently. In a lawsuit filed two weeks ago in state court in Arkansas, where Wal-Mart Stores is based and Mr. Lynn lives, he asserted that he was terminated in 2002 "for truthfully reporting the abysmal working conditions in Central American factories utilized by Wal-Mart and for refusing to comply with Wal-Mart's demand that he certify factories in order to get Wal-Mart's goods to market." Their group is the latest manifestation of the ongoing campaign to change Wal-Mart Stores Inc., the nation's largest private employer. After years of failed attempts to help Wal-Mart workers organize a union, leaders of the United Food and Commercial Workers are trying an Internet-oriented approach developed in recent failed presidential campaigns. "For a number of years, we were going by the rules," attempting to sign up workers under rights granted by the National Labor Relations Act, said William T. McDonough, head of UFCW's organizing department. "We got very frustrated." This is somewhat disturbing. Wal-Mart is opening up a new super center in Middlefield OH which is home to a large Amish population. To accomodate they have an area of the parking lot dedicated to horse carriages. Read the full story here. The Quebec Labour Relations Commission has turned down a request by the United Food and Commercial Workers Union (UFCW Canada) to order Wal-Mart to reopen a store at Jonquiere, Quebec, that the retail giant closed after employees voted to unionize. Pierre Flageole, vice-president of the commission, rejected the union motion this week, referring to a Supreme Court of Canada decision recognizing that "an employer maintains the right to close down its business, whatever the reasons."